Whether you celebrate the day or not, have a stellar day. Always. 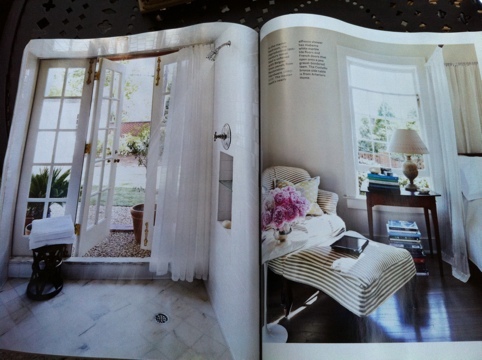 Thrilled & honored to be in House Beautiful this month. They asked me to shoot a dining table I had set at Hawthorne. What fun it all was! Pulling all the green things from around the house that have special meaning to us on a beautiful sunny day. TPS cut hydrangea from the yard. 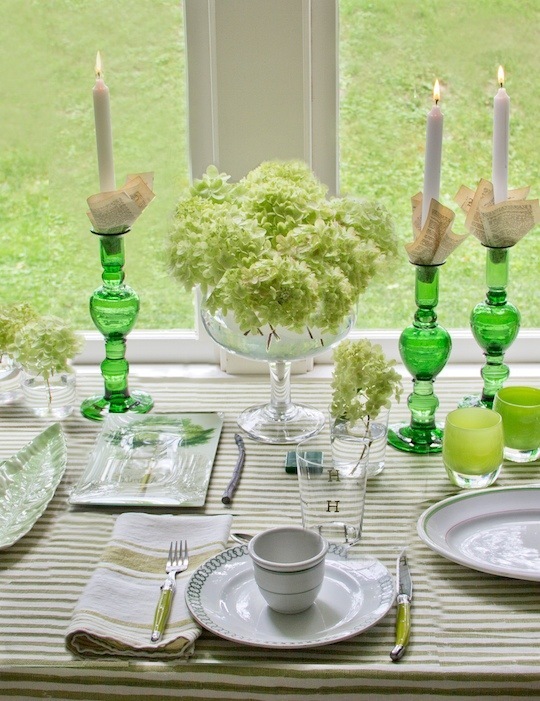 We pushed the table all the way to the window so you could see a bit of green from outside. Fun to include bits of things from Seattle, Hudson, our travels, and gifts we have received. The green leaf dish from Mary, a TKW blog reader since day one, that she sent to me in congratulations of my book. 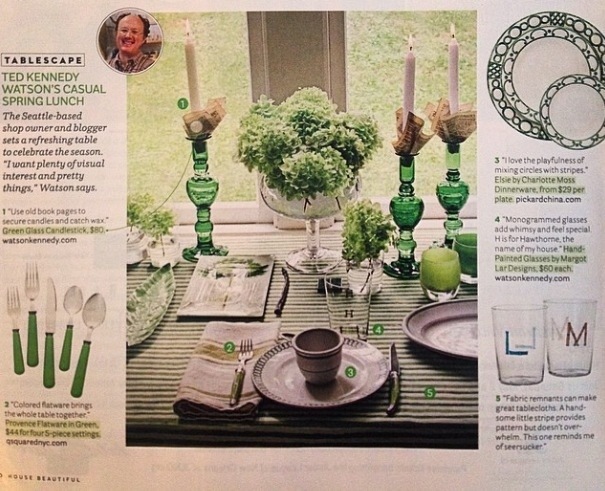 It really is a table filled with some of our most meaningful green things. The above taken from the page of the magazine. The below a clearer shot the magazine sent me after it had been cropped. House Beautiful really is one of my very favorite design magazines, so it tickles me to see a slice of Hawthorne grace the page. 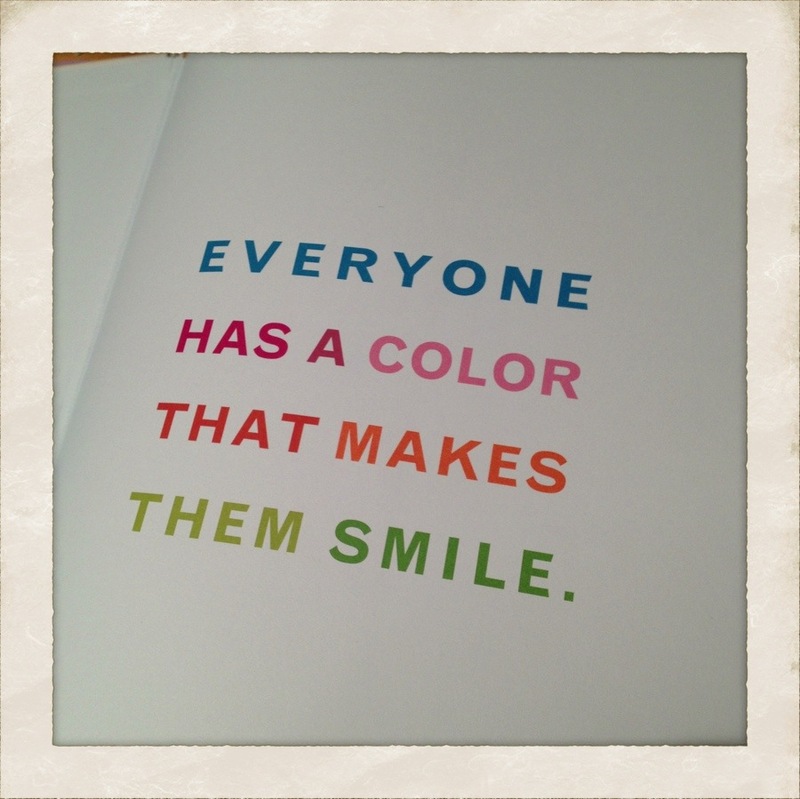 My new favorite book on color. Big stacks at both shops. 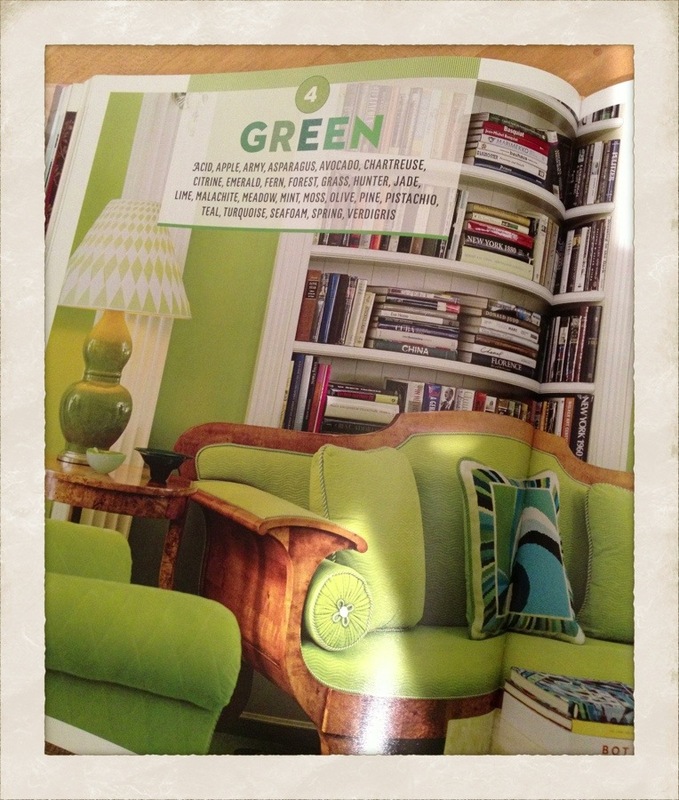 House Beautiful does just the best books. 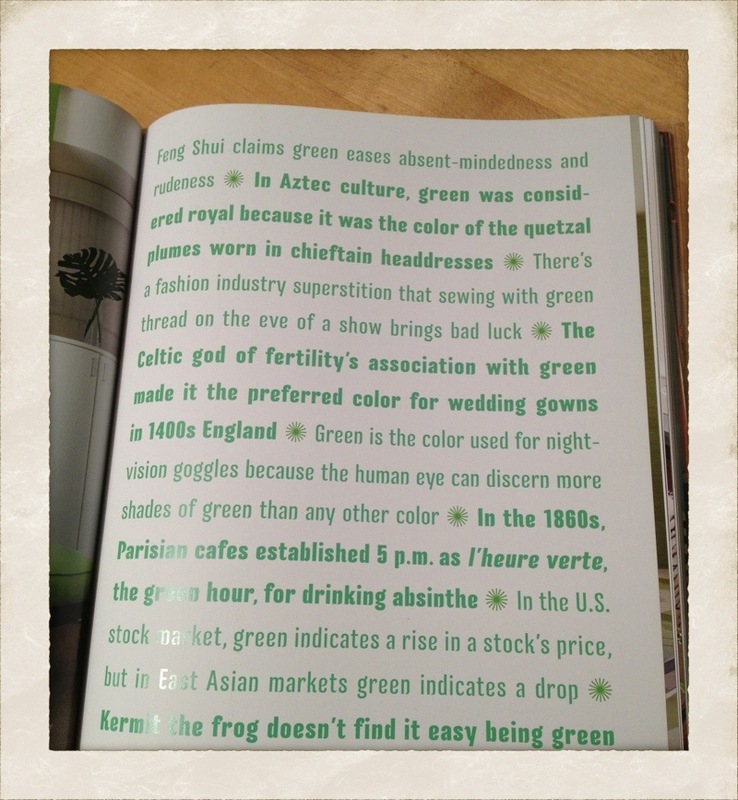 This is an extensive look at color. Broken down by hue, with oodles and oodles of images using the color. I always like it when the manufacturer and the actual color code and name are listed. This really is the key to the success of this book. As much a resource guide as an inspiration book. 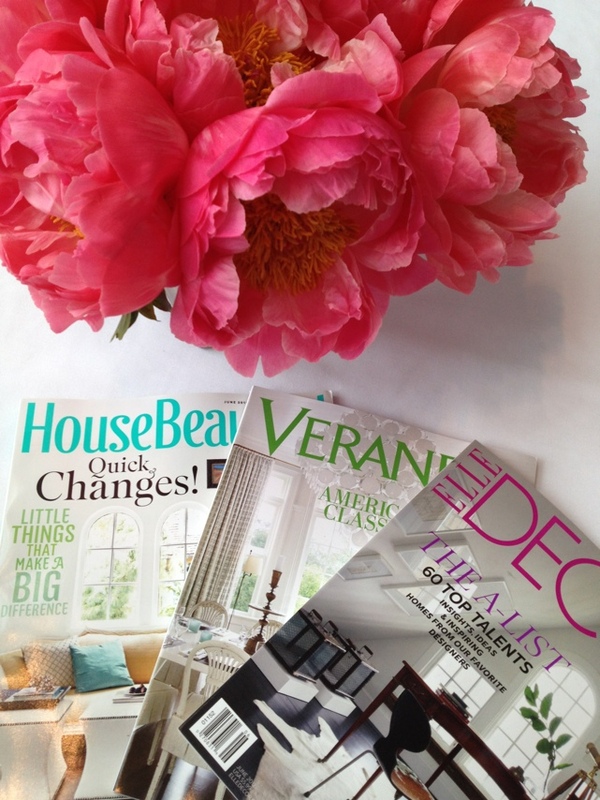 I was honored and thrilled to be included in the current issue of House Beautiful, out on newsstands now. The Last Words, is the last page of each issue. The question posed this month was, what will you buy next year? “Always on the hunt, the best shopkeepers see it all. Here’s what some of them are eyeing for themselves.” It was a fun twist to come up with something to buy for ourselves, rather than to sell in the shops. 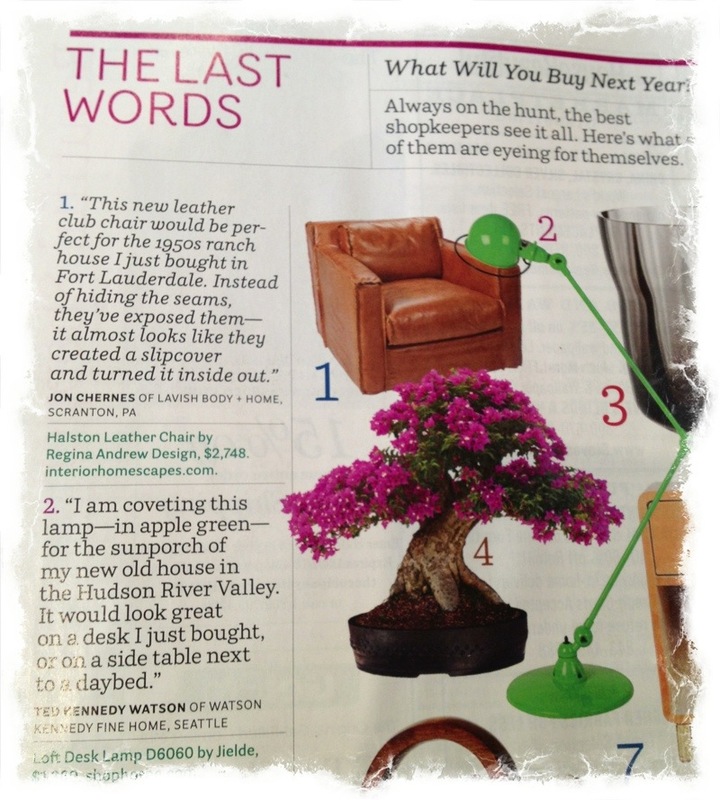 My head went right to an apple green French Jielde desk lamp for our house in New York, Hawthorne. They make such classic, iconic pieces, and this is a lamp I have coveted for quite some time. Fun to see what the other shopkeepers are eyeing for themselves too. Lovely to be included in the list–we heart House Beautiful big time here at the Watson Sive household. 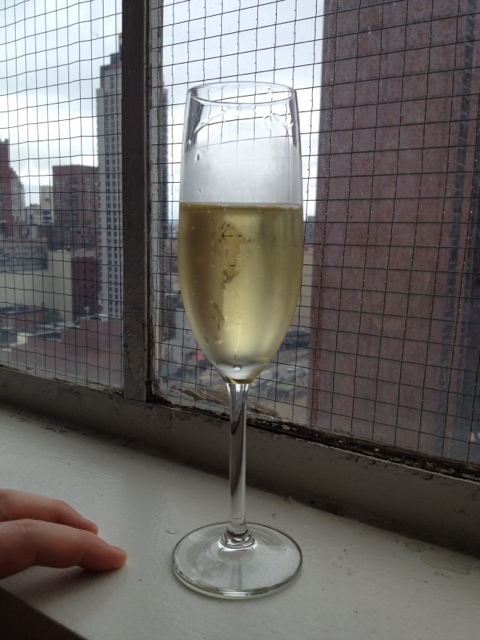 A spirited Friday to each and every one of you as we head into the week-end. I just saw this quote after I finished the above post and thought it was so beautiful and perfect for the day. We have both been a tad under the weather, so I was very excited when I opened the mailbox and found my 3 very favorite Hearst magazines waiting to be enjoyed. An instant pick me up, and perfect for getting my creative juices flowing while not feeling well. House Beautiful focusing in on the perfect color combinations. Town & Country highlighting Spring Fashion, perfectly timed with Fashion Week in New York. They did a shoot at Frank Lloyd Wright’s Taliesin West, which was beautifully done. We took a trip there years back, and the photos brought back great memories of the spectacular setting and ruggedly warm spaces. 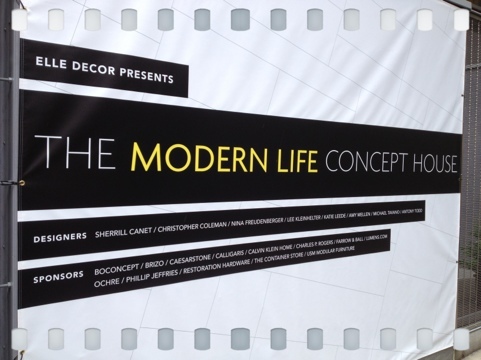 The feature of design is the focus of Elle Decor this month. 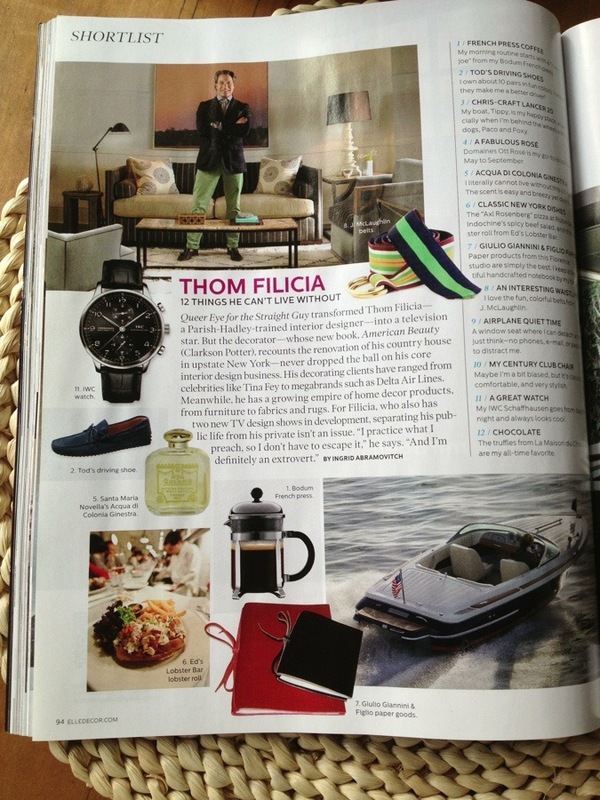 But my favorite section is always “12 Things He Can’t Live Without” Shortlist section. 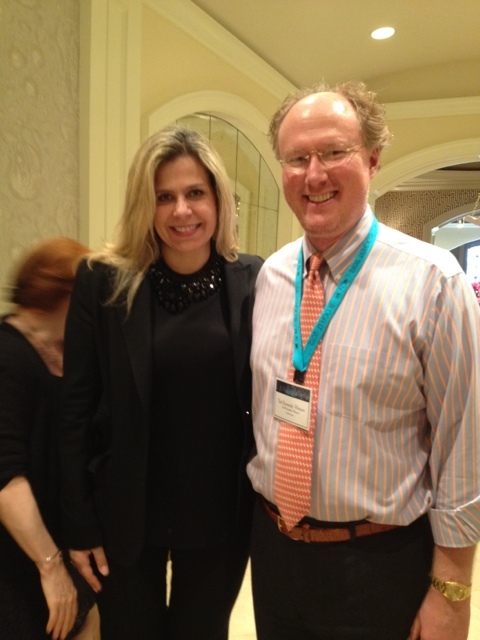 It highlights designer Thom Filicia, who I had the pleasure of meeting last May when I attended the Blogfest on Design in New York. He was just the most gracious, down to earth guy. We spoke of his then upcoming book, ‘American Beauty’ which is now out. 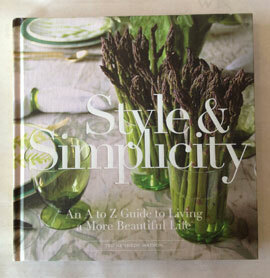 Put it on your list if you are looking for a new design coffee table book–it is really lovely & filled with great ideas. Lots of rest, lots of fluids, mixed with lots of good reading and I am ready for a busy Valentine week at the shops. Happy Tuesday! 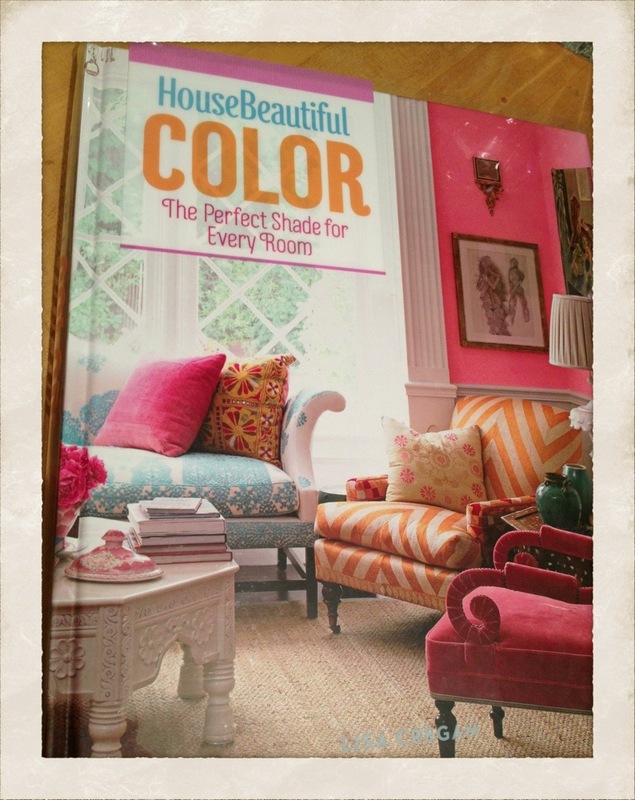 A book that keeps flying out the door for us is ‘Colors For Your Home’ by House Beautiful. Based on the popular monthly column in the magazine, this little book easily fits into a purse or valise. 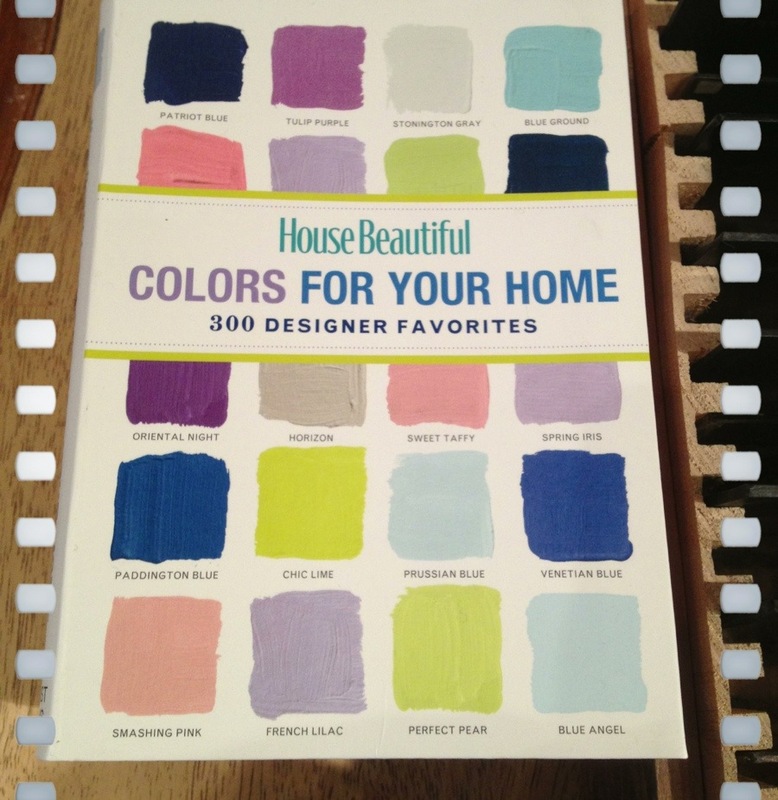 Perfect for bringing along to the paint store when you are choosing new paint colors, with 300 designer favorites. What I like best is it lists the paint company, the color, and the color number. From Benjamin Moore to Farrow & Ball, it highlights all the best paint companies and many of the spectacular colors they offer. All presented in lovely room after lovely room, so you get a snippet of how it looks in a real setting. 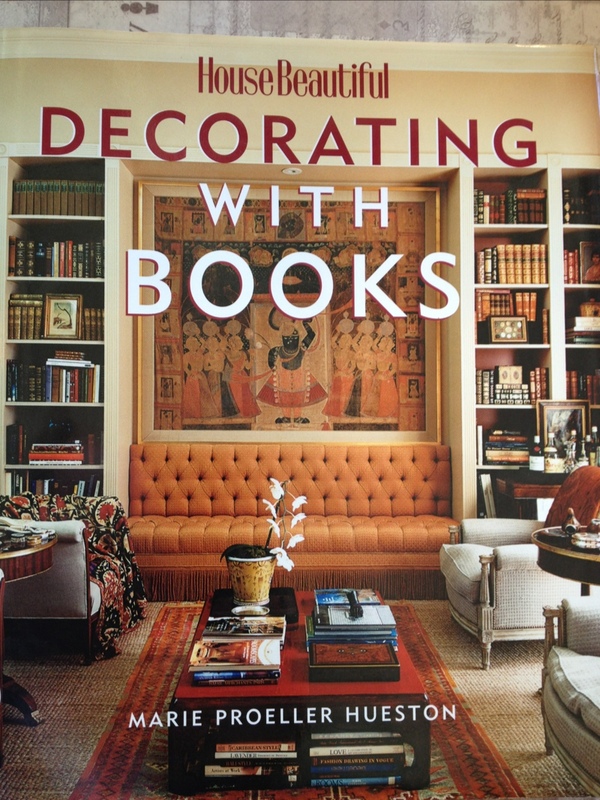 A book that I have been thoroughly enjoy and that has been flying off the shelves at Watson Kennedy is ‘Decorating With Books’ that is part of the House Beautiful series. 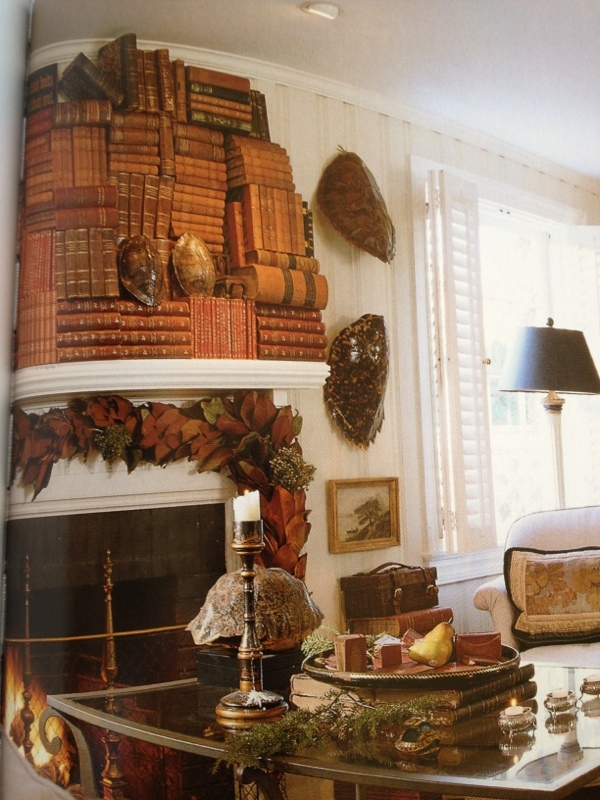 I love seeing how folks incorporate books into the design of a room. It is filled with page after page of ideas and inspiration. 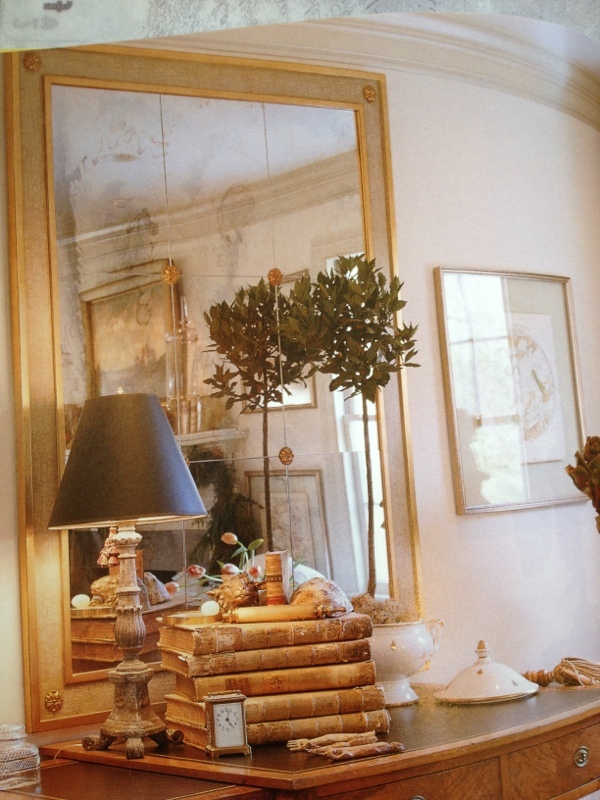 And of course, I adore seeing a room of a designer’s home whose work I greatly admire. The last photo above is of the home of Stephen Shubel and Woody Biggs. 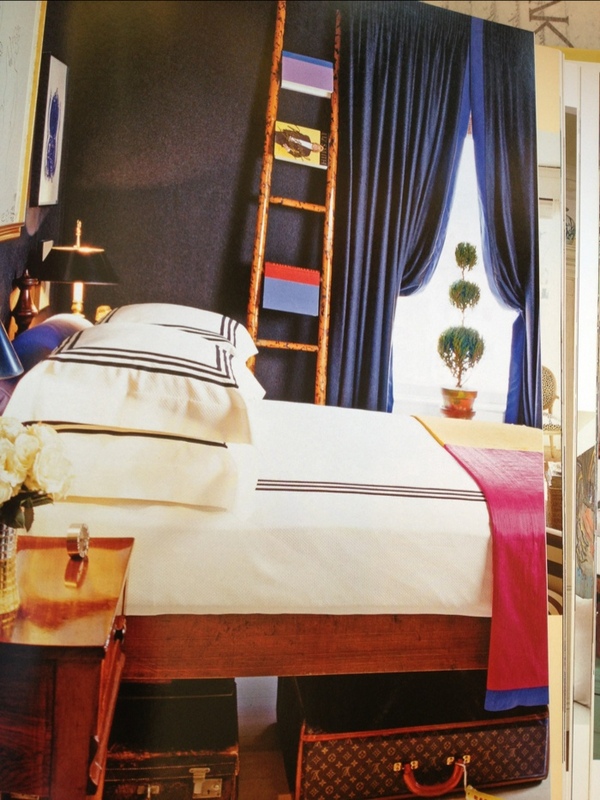 I can spot a room designed by Mister Shubel the second I flick through a magazine or book–comfortable, amazing attention to detail, and always a hint of gold & a slipcover or two. The type of room you just want to sit with a friend and chat. Or curl up with this book and dream away. The mailbox is always brimming with new magazines at the beginning of each month. I am like a kid in a candy store, excited with anticipation. I had a group of shoppers ask me the other day what my favorite magazine is at the moment. 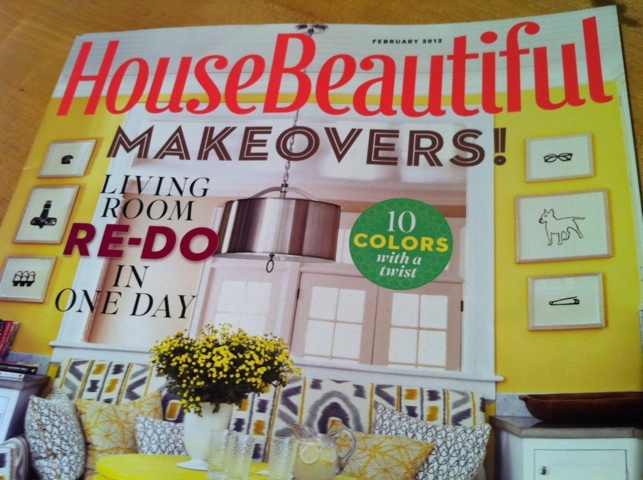 I really did not have to think too long, as House Beautiful has been the answer for quite some time. This month is no exception. Actually, it is at an all-time high. Under the stylish eye of Editor in Chief, Newell Turner, the magazine just keeps getting better & better. They shoot a great variety of homes, from small to grand, to crazy expensive to done on a budget. My number one complaint with many design magazines is lack of variety. If you are shooting a 10 million dollar apartment, furnished with an equal amount of dough spent on the furnishings, it had better look pretty darn amazing. I like seeing both ranges of the spectrum–from a smartly designed studio to an over the top house. The variety in House Beautiful does just that. Even as a kid, I was intrigued by what could be done with a small space over that of a larger one. I always chose the smaller bedroom when my siblings would want the bigger ones. In college, I opted for a smaller room in a historic building on campus, instead of a room in a new building that had rooms twice the size. 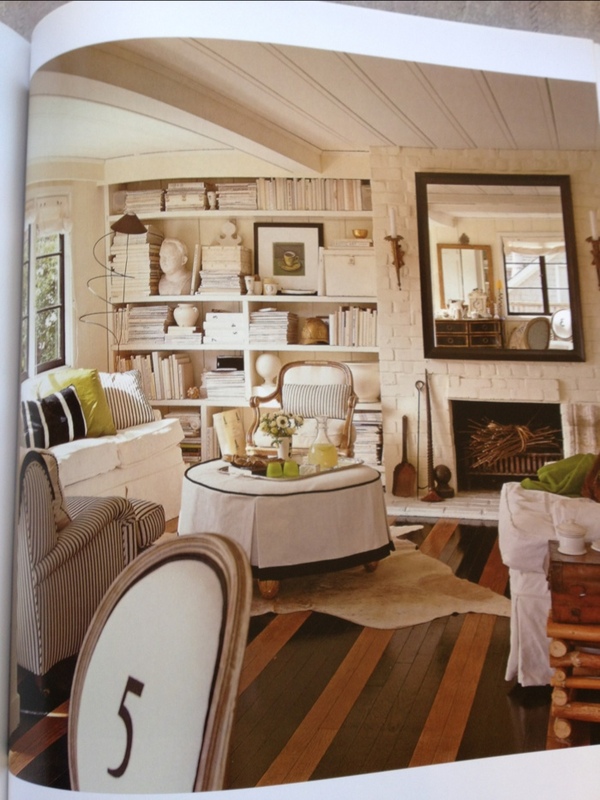 I have always gravitated to, for lack of a better word, the coziness a small space. 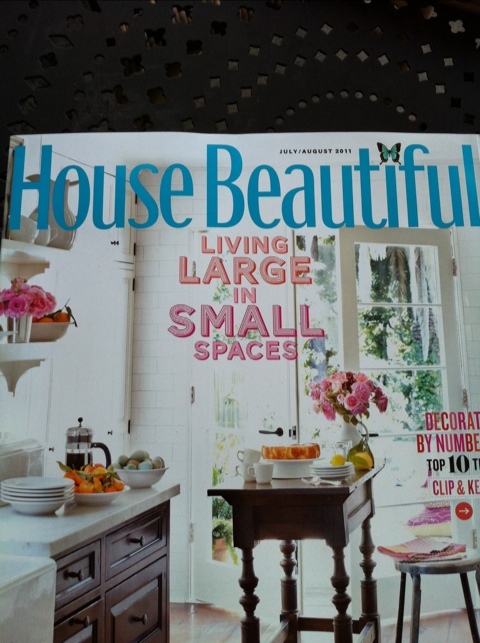 So I was delighted when I opened the mailbox last night and reached in and pulled out the last House Beautiful. I have long been a big Stephen Drucker fan, and was delighted when he showed up at the shops a few years back to check them out. I was saddened to see him leave the magazine, but knew it was being put in the very capable hands of Newell Turner, who I had also long admired. Newell has not disappointed. Under his guidance, the magazine has stayed fresh, and is even a tad more approachable. Very few top notch design magazines would put out an entire issue devoted to small spaces, and bravo to them, they have. “The charm, the beauty of small houses–or of any small living space, for that matter–is in the creative and stylish ways we decorate them and make them work.” Newell could not have stated it better. 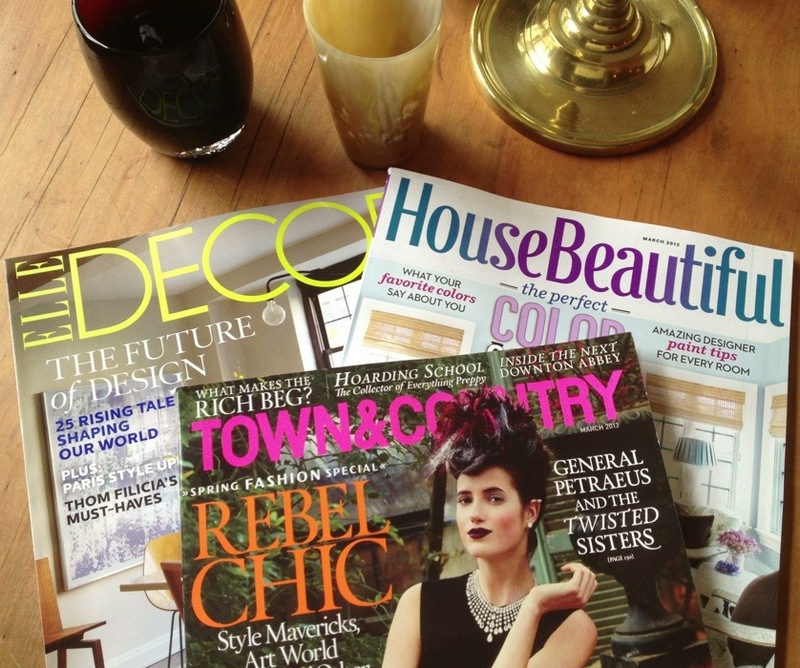 Check it out, it is a fab issue, with tons of design eye candy, and great small space ideas. The above shower with a door leading to the outside is just too cool for words.